Several months ago, there was an influx of new students, and I suddenly found myself teaching much more frequently than I had just previously. Welcome as this change was, it was soon accompanied by changes that were rather less welcome: Aches and pains, the kind that keep you awake at night and threaten to cause greater injury. 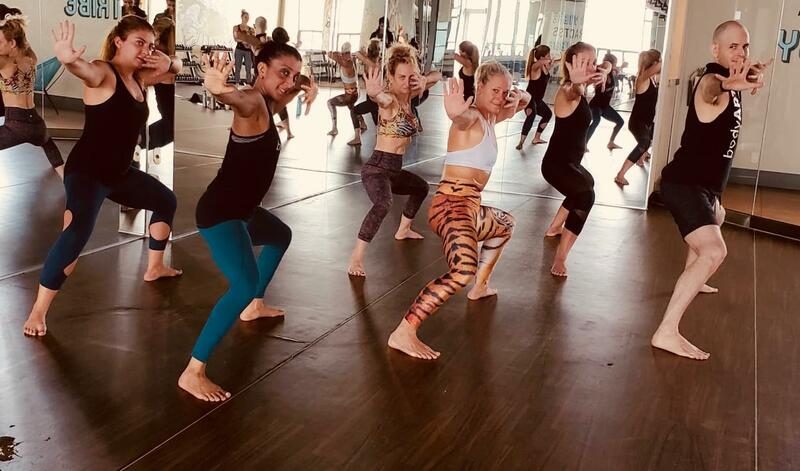 I’m not a believer in trying to cover up pain with medication, and after trying unsuccessfully to “tough it out”, I dragged myself into a consultation class with ballet teacher Emily Tench. What does that mean – other than extra time running in place before a lesson? Dance, like all physical activities, stresses and strains the body, often in new and unexpected ways for the initiate. It can be especially bad when the dancer is repeating the same moves over and over – unless something is done to rebalance the body. The first – and easiest – thing any dancer can do is warm-up their muscles before they teach a class. Before I start my first class of the day, I jog around the floor, once with knees up, once with heels up, then do side shuffles several times down the centre, followed by some light dance moves. The whole thing takes about 5 minutes. A second option is to stretch areas where you feel tightness. This may not have to be stretching per se – simply practicing your Cuban motion at half power can help loosen up the prerequisite muscles before you dance full-out. Make sure your muscles are warm to get the maximum benefit. The third option requires a bit more knowledge from a fitness expert. It involves strengthening the stabilizing and antagonist muscles. What are thoooooooose? (I couldn’t help myself.) The stabilizing muscles, as the name implies, provide precision and control, while the antagonists act against the intended motion to balance it in the body. They can be a pain to isolate and work on, but the reward is higher quality, safer movement. Much of what I learned about the different muscle groups I owe to Noel Miller, our fitness pro at Joy of Dance. He specializes in a holistic approach designed to help support healthy movement throughout a dancer’s life. Give us a call at 416-406-3262 to request a free consultation.